A rugged design for the toughest challenge, now with NSF/ANSI 61 and 372 certification. 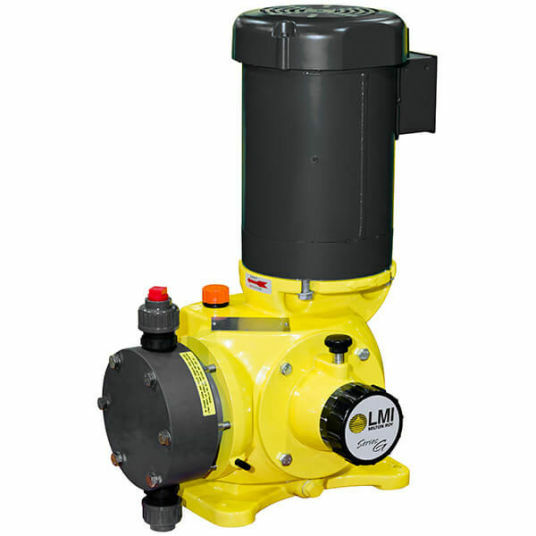 Available in two motor driven models – the SD and the SG – the Series G Metering Pumps feature rugged aluminum construction specifically engineered to handle higher output and higher pressure applications in harsh environments. Certified with NSF / ANSI 61 and 372 for municipal compliance and safety assurance, the Series G is the right choice when choosing a pump for water treatment. By combining a heavy-duty industrial drive with state-of-the-art design, the Series G offers a mechanically actuated diaphragm that provides smooth output with reduced potential for system shock and hydraulic oil contamination. External speed control, stainless steel fasteners and NSF certifications make this powerhouse pump perfect for water treatment applications. This pump is designed to last. The PTFE, high performance diaphragm design eliminates the stresses inherent in most designs – plus, all gear components operate in an oil bath for long life.